How did I spend my birthday yesterday? In the morning I went down to the orto with ten litres of desperately needed water for the few tomatoes and courgettes which are surviving the prolonged drought. Later I was joined by my wife followed by one of our cats, Carlotta, and we relaxed by playing a game of boules. Carlotta joined in the fun though I was lightly reminded of the game of croquet with flamingos in Alice in Wonderland. Carlotta was very good at estimating which boule was closest to the winning post. we were given the most wonderful weather present in a rainstorm. We rushed out just to feel the cool water drip over us and have our first shower for some days. Sheer bliss! 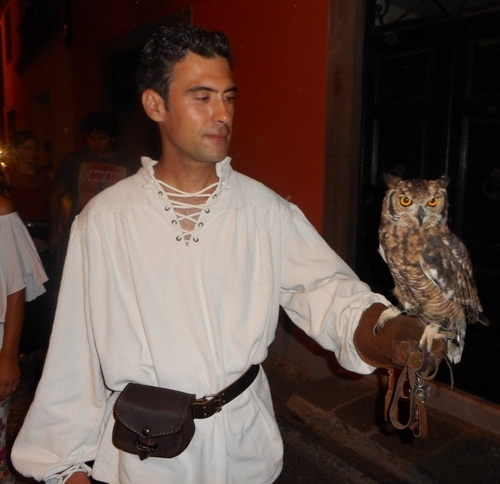 It’s medieval festa time in Italy and we decided to visit the one at Coreglia Antelminelli and meet up with friends there. There were stalls and even a mediaeval dentist who we definitely wanted to avoid even though he seemed cheaper than your standard high street one. Everything was beautifully organised. Entrance was free and we only paid for what we wanted to eat which in our case included an antipasto and a sweet. 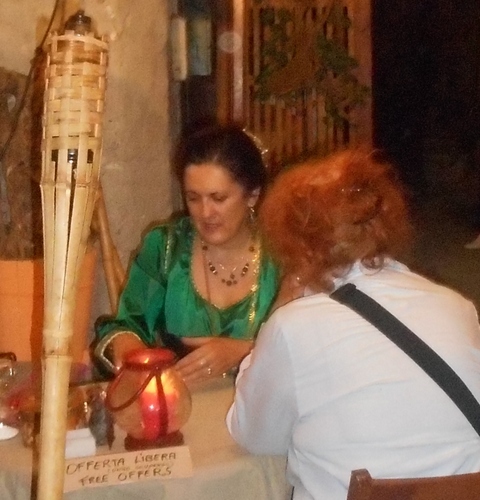 Every mediaeval festa has it special highlights. For Coreglia Antelminelli these were four groups of Sbandieratori or flag twirlers. Their virtuosity and choreography were of the highest standard. As everyone knows Gallicano’s Sbandieratori always win national prizes for their displays but even Coreglia’s own group, mainly consisting of girls, was excellent. A somewhat fiery combat between two knights then took place. An amazing act involving a fiery girl followed. And, to top it all the evening ended with an absolutely spectacular fireworks display. We didn’t hold a birthday party in our orto this year. It was just as well since our village hadn’t had water for two days and it was still uncomfortably hot at 5.00 pm. 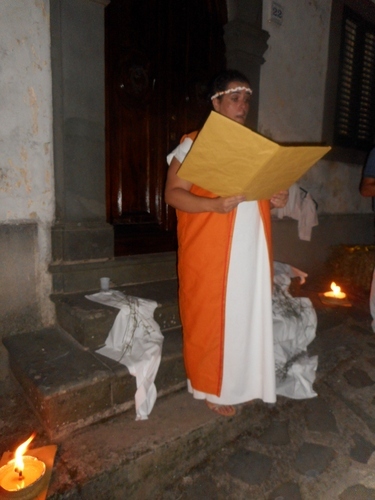 Instead, we had a glorious time just with ourselves in the morning and with one of our cats and, in the evening, with our friends in the fabulous pageantry of Coreglia Antelminelli’s superb Festa Medievale. Again, crowds were just the right number and the navetta (shuttle) service ensured that there were absolutely no traffic jam when we returned home around 1 in the morning to arrive at a village wonderfully cooled by the storm. 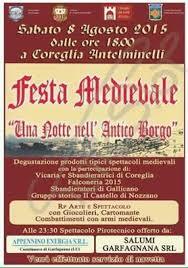 There are plenty more mediaeval feste in Italy. There’s, of course, our local one at Gombereto and the highly picturesque one at Nozzano Castello but what we saw last night would be a hard act to follow. Pian Della Rocca is usually by-passed on one’s way from Gallicano to Borgo a Mozzano and beyond. Apart from a monumental electricity generating station and some useful garages for revisione (MOT) and car repair there’s not too much to stop there for except for an excellent espresso at its one and only bar. 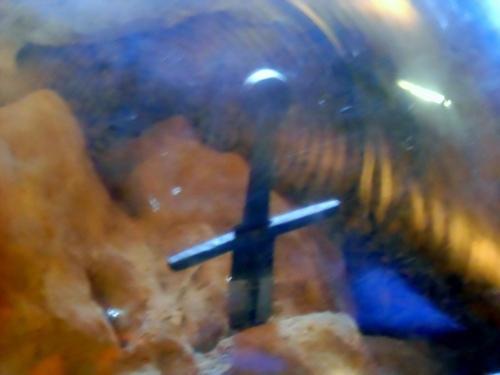 Rocca, above it, is quite another fish, however. Rocca clearly mean rock in Italian and it’s the ideal place to build a stronghold. The village has one dating back to at least the fourteenth century, if not before. Rocca rises 314 meters (1030 feet) above sea level and is built on a steep slope of a hill dominating the valley of the Serchio and Lima. Thanks to its strategic location it was a stronghold of the Suffredinghi clan for many year before Lucca took it over. The settlement retains the characteristics of a medieval village with stone arches and narrow cobbled streets, clearly part of the castle keep at one stage. At its top are the ruins of the old fortress and the base of a circular tower. 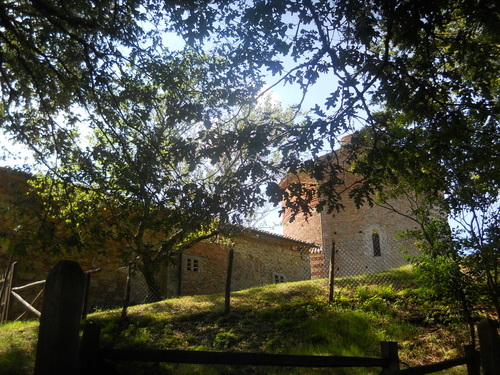 The village church was built between the eleventh and twelfth centuries and is attached to a spacious rectory which was once the seat of Suffredinghi and the Antelminelli. We’ve visited part of the rectory before, which contain an interesting collection of old farm implements, but it was closed when I went to Rocca the other day. 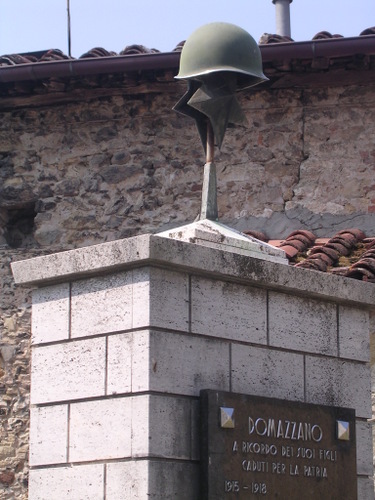 The road leading to Rocca has a chapel dedicated to the Alpini on whose wall are the names killed or missing in two wars in Borgo a Mozzano comune. Unlike the other Alpini chapel on top of Bagni di Lucca’s Colle, this chapel has nothing modern about it. It’s a conversion of an old oratory. From it an avenue called the avenue of the fallen rises up into the surrounding sweet hills and behind the chapel are a series of coats of arm of the various regiments involved. It should be remembered that the Alpini suffered the worst losses in World War II when Mussolini had the crazy idea of aiding Hitler in the conquest of Russia. The Alpini, because of their experience of mountain combat, were meant to conquer the Caucasians but instead got bogged down in the River Don valley to disastrous effect and with inadequate clothing and ammunition. Just look at any war memorial in our valley and you’ll see the longest list of soldiers commemorated on them is those “dispersi nella Russia”. It’s difficult to realise this context of war in such a beautiful setting ,especially when one sees the gentle countryside dotted with the picturesque hay stacks one builds in this part of the world. The hamlet of Domazzano lies on a side route from Borgo a Mozzano to Lucca. One turns off at Valdottavo and find the sign for Domazzano to the left. Lying at a height of 190 metres and with 130 inhabitants, Domazzano is a sweet little scattering of houses with a beautifully simple Romanesque church, remarkably untouched by later accretions, a separate, later, campanile and some gorgeous views. The church dates from the twelfth century and still preserves the original plan. It was slightly damaged in the last war, as a result of which tombs arranged in a herringbone pattern following the main church axis were discovered and an opportunity was taken of removing later additions, including a wall that separated the nave from the gracefully curved apse, and taking the walls back to the original stonework, thus restoring the building to the typical single nave plan of so many Romanesque churches in Lucca province. Domazzano assumed an important role during WWII when it lay on the main Gothic line. From it a footpath leads to the top of a hill where trenches laid as part of the defences can still be clearly seen. The walk up to the top takes little more than half-an-hour. There is also the base of a cannon platform. Returning to Domazzano you can take a different route through a beautiful wood. Domazzano’s war memorial is an odd mixture consisting of a plinth dedicated to those who fell in WWI and an added G.I. helmet with a US star to commemorate the allied intervention in WWII. We’ve done this lovely walk at least four times. The pictures you’re looking at all date from July 2006. Train journeys are one of the delights of Italy. Unlike the UK rail network, which not only has some of the highest fares in Europe (my journey from Stansted Airport to Liverpool Street Station London cost me more than my flight from Pisa to the UK!) but also has a very London centred network in which, for example, there is no direct rail route from Cambridge to Oxford without having to go to the great Wen, the Italian rail system can be remarkably good value if one steers clear of the super freccie rosse and bianche express trains. Anyway, why travel non-stop to big cities when some of the most delightful places to visit in Italy are to be found by minor stations? 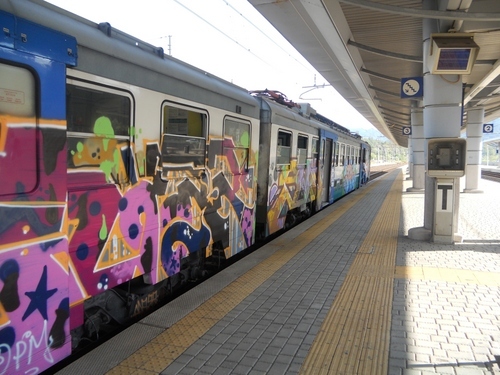 (Graffiti are a fashion on many Italian trains). We halted at one of these minor stations yesterday, Filatteria, and walked up to find a delightful borgo at the top of our road. To reach it we followed part of the Via Francigena, the ancient pilgrim route to Rome which has in the past few years been put back on the map again. I noticed that indications showed it was a little over 1200 kilometres to Canterbury… I wonder how many of Chaucer’s pilgrims would have continued to Rome – the Knight certainly. 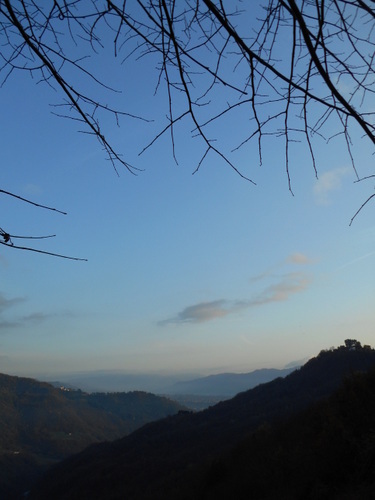 Filatteria isn’t on anyone’s immediate list of things to see in Lunigiana, let alone Tuscany, yet it has all those features which make even the remotest hill village endearing. Founded in 540 by the Byzantine general Belisarius under orders of Emperor Justinian, the town was built as a fortified settlement. Its name, in fact, derives from “Filacterion”, the Byzantine name for a castle. Eventually, Filatteria became the property of the Malaspina and entered into the Grand Duchy of Tuscany in the sixteenth century. The castle, belonging to the Cesare Buglia family, still remains and is visitable on Mondays from 2 to 4 throughout the year. Trust our luck to come on a Tuesday, but we still saw something of it. Filatteria has three parallel streets with some picturesque houses (and cats) on them. 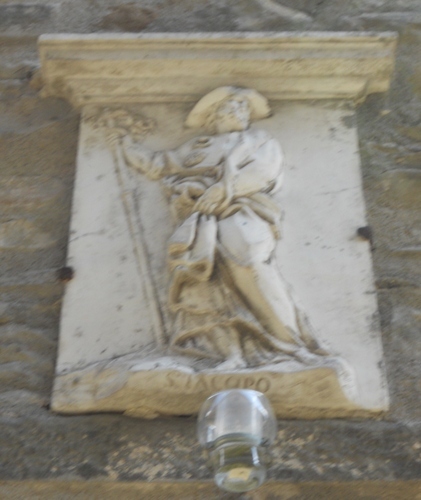 In the first street there is the hospital (corresponding to a hostel today) caring for pilgrims going to Rome by the knights of the Tau from Altopascio, an order which protects pilgrims from infidels and bandits, and dedicated to Saint James whose plaque is over the main gateway. Fortunately we did not need their protection yesterday. In the middle street there is a church which, although of austere exterior appearance, is delightfully light and playful inside. Of all churches, however, that of Saint George at the end of town is the most moving in its Romanesque simplicity. No matter how theatrically elaborate Italy’s baroque churches may be, none of them ever can approach the exalted spirituality of these unassuming structures. On the left wall of the church there is an eighth century tombstone with an epitaph to Leodgar, a missionary bishop sent by the Pope to convert the Longobards who were suffering under the Aryan heresy which denied the divinity of Christ. We returned to the station and had a little time to catch our train back home. I then spotted another Romanesque church a little way on. We decided to visit it. 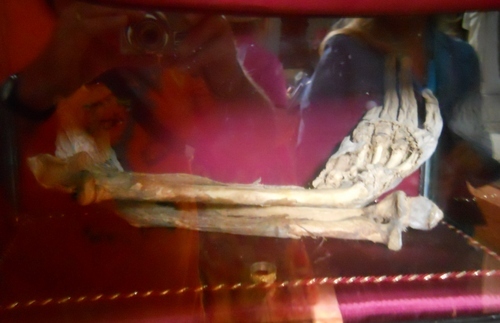 Thank goodness we did for it turned out to be the great Pieve di Sorano and inside it was another superlative surprise – a prehistoric stele – like those we had visited at Pontremoli in July this year: see https://longoio2.wordpress.com/2014/07/12/the-magical-steles-of-pontremoli/ – only discovered this century. In fact, there were two steles. One had lost its head but the other was definitely one of the best we’d seen of these extraordinary objects. My advice: just take to the train and alight at that insignificant little station and then walk – Italy is so rich of sights that one is bound to find something extraordinary as we did at Filatteria.